Charlton Lido in the September sunshine. Friday morning sessions have now been reinstated until the end of October. The pool will be open 7am-12 noon. A note has appeared on Charlton Lido’s website announcing changes to the new winter pool opening hours: the pool will now open on Tuesdays and close on Fridays. Presumably they’ll be emailing members with the update at some point….Many thanks to the commenters on this post for alerting us to the change. We’ve also been told that there will be a customer forum held on October 18th; email invites are due to be sent on the 3rd of October. 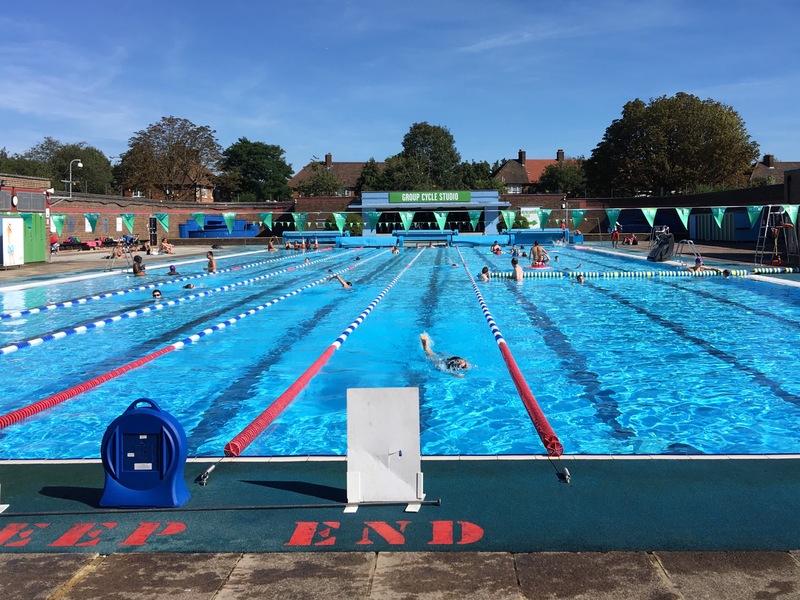 Charlton lido swimmers’ hopes that a late summer heatwave would lead to extended winter opening hours have been dashed, with news that the pool will be completely closed on Tuesdays, Wednesdays and Thursdays until March. We hope you have enjoyed the summer and are planning to swim into the winter months. Unfortunately the colder months will be soon upon us. With this in mind we would like to introduce you to our winter programme which will operate from the 1st of October 2016 through until March 2017. The programme has been carefully thought out taking into consideration last years trends in usage, customer feedback and facility feasibility. If you are an annual or monthly member here at Charlton Lido & Lifestyle Club you will shortly recieve[sic] an email to confirm the programme changes. This email will also outline alternative options available to our members over the winter months. It’s unclear why – after a presumably busier-than-usual summer, thanks to the good weather – it’s necessary to cut opening to this extent; GLL have held fewer customer forums this year than previously, and emails to members remain infrequent. Hopefully the email to members mentioned above will shed some more light. We recommend checking the timetable before visiting. Thanks to Steve Toole on Twitter for alerting us to the new opening hours. Have had no communication from management. We winter regular swimmers are being treated as if they don’t want us, but only want the fair weather swimmers. Have put up with the inability to swim lane swimming or training all this unusually hot summer in the hope and expectation that the hot weather and full pool would subsidise winter opening, at least to the extent of continuing last winter’s opening hours. If they persist in ignoring members and closing midweek, I’ll be cancelling my membership as will my O.H. I’ll be emailing management (Mark Sesnan is the MD on this I believe) and hope others do likewise. Charlton Lido have a Twitter account so let them know on there. We had to battle last winter as well to get those hours, so please people, complain. What’s particularly galling is that the pool’s been much busier than usual with the good weather, but they don’t have the flexibility to open after 5pm on a sunny weekend day, or keep the cafe open after 5pm on a busy midweek day. Add that to the car park ticket meters being out of action for a couple of weeks, and it’s hard to escape the conclusion that they’re turning money away. Absolutely right, Neil. I am sure it was opened virtually every day last winter, albeit for limited hours. There is so much more GLL could do to promote it. David, who at the council is responsible for scrutinising GLL? I know RBG is inclined to view GLL in a favourable light whatever, but surely questions should be asked as to why they’re so bad at communicating to their paying members. Sneaking out this kind of sullen, badly-formatted message on their website without explaining it properly to users is no way to engage people. Someone should be asking why London Fields Lido can maintain longer hours and open every day through the summer. If the answer is ‘they have more members’, then what are GLL to recruit members? Their advertising is amateurish at best (a picture of an exercise bike and some hard-to-read bullet points on the back of the 53 bus being a recent highlight), and they seem determined to discourage monthly/annual members from maintaining their membership over the winter. Swimmers I know (and people who contact us through this site) are concerned about the lido’s future. Some reassurance from the council and GLL would be welcome. If they genuinely can’t afford those 6 hours, rather open mornings or afternoons, not both, and close one day a week. I hope something .. better…. can be worked out. It’s the best pool in London. “Thank you for taking the time to contact us regarding the winter pool programme. We are sorry to hear that you are unhappy with the winter pool timetable changes. Unfortunately with the colder months approaching we need to reduce the hours the pool is open, not only due to the higher costs involved with heating and maintaining a 50 meter pool, but mirrored with the decrease in usage. Unfortunately it is not financially viable to remain open and operating with a full programme. We understand that there is a balance between being open for users to swim versus being closed therefore reducing access, however this is now the third year of opening the pool throughout the winter months and the timetable must balance both usage and costs. If we were to remain consistently open through the winter months like we do the summer months, the Club and Lido would have no option than to close within a year as the business plan would simply not work. Better have invested £4.5 million into the refurbishment of the Club and we are more than committed to make the Club & Lido work. I am sure you can understand when amending timetables for all our members it is difficult to accommodate everyone. The times which have been selected have been carefully thought through and usage trends were taken into consideration before any decisions were made. We held a customer forum in May to discuss the facilities and programme. All customers who had opted in to receiving information from us were invited via email. Unfortunately no swimmers booked or attended that forum. We are currently in the process of planning another forum in October and again invites will be sent to members via email. In the past the Lido was not accessible or maintained throughout the winter months. When taking this into consideration Better are pleased to be able to offer this service (although limited at the moment) throughout the colder months. Unfortunately we need to be patient and grow our member base, with time and growth the pool will be able to stay open for longer during the winter months as it will become more self sufficient. The growth needed will take time but we hope year on year to be able to offer additional times and sessions for the Lido. Your membership allows you access to all Better operated facilities across London (excluding centres in the borough of Camden). With various options available we hope you’re able to continue to find a time to swim. However if the new pool timetable and surrounding pools are unsuitable then we can arrange either a cancellation or a freeze for you over the winter period. I got the same standard response. I’m very disappointed in the decision and management of the winter time table, especially to reduce the hours from the 1st of October! Again, it’s absurd that they shut at 5pm in the summer on weekends and don’t open until 9am ( when club swimmers take up the lanes) . Keep complaining and hopefully we will continue to enjoy winter swimming in this wonderful pool. It keeps me happy over the winter. I got the same cut and post response…though no mention of any customer forum. Perhaps the reason no swimmers attended in May was because they did not know about it! I certainly knew nothing about it nor about one in October. I also asked why London Fields Lido (also “Better”) had no reduction in its winter opening hours and continues to operate its pool from 6.30 to 9pm daily. I was told its because they have 4X the membership at Charlton. Bit of a problem here: how can you grow your membership by closing the pool for 3 days a week???? Like others I’m bewildered at the approach being adopted by Better’s management – the hours proposed for this winter will be the third different pattern in as many seasons, so I can’t see how there is any basis for justifying them based on past usage. The only way to grow membership is to stick to a consistent pattern and then increase it as take-up improves. Last year the initially publicised winter hours caused such a backlash that a survey was belatedly undertaken to assess demand, after which the hours improved. Why has no such exercise been undertaken this year? I wasn’t invited to the customer forum in May, despite having asked to be on the mailing list for such events – but as attendance is limited to 15 participants each time it’s hard to see how they can be representative in any case. What’s needed is a properly constituted User Group, with periodic open meetings for as many people as would like to attend. Whilst managers might be nervous of such a forum, the reality, I suggest, would be that it could develop a form of really constructive engagement from people who would like to help find solutions rather than – as is the inevitable result of announcements like last week’s – simply generating a tide of protest and complaint. 1. Delay the introduction of the winter hours at least until the clocks change at the end of the school half term holiday, and use that time for a proper consultation. 2, Refer back to the response sent out last year when people complained about the proposed hours: much of it was identical to the response Neil quotes above, except that the sentence “The times which have been selected have been carefully thought through and usage trends were taken into consideration before any decisions were made” did not appear – instead, we were told “when reducing the hours we will not be able to work it so that all are happy and we will therefore go with the most popular times – this is the early morning swimming times. After the morning session, the pool usage drops dramatically and we are very quiet for the rest of the day”. Presumably this is still true (Friday evenings in particularly are usually very sparsely attended) – so why are only 2 weekday early mornings proposed this year? 3. Invite ALL users to an open forum, and do this via advertising it at the centre and on the website, not just by email (a friend of mine queried the other day why she wasn’t receiving emails – and found that the email address attached to her membership number belonged to someone else entirely!) – and with at least three weeks’ notice to ensure as many people as possible have a chance to attend. 4. Have a look at the signboard outside the centre: “Our 2012 legacy…. Delivering first-class community facilities fit for future generations”. It’s abundantly clear that the needs and wishes of users have been low on the priority list when making decisions about winter opening. As an almost daily user and passionate supporter of the lido I find this deeply dispiriting, but I hope enough of us can use our collective powers of persuasion to bring about a more positive approach from the centre. The irony being I was about to sign up for a swim only membership as I’d decided I was going to stick to my twice a week regime. Probably no point now and as a non member im not notified anyway. I’d gone back into the pool after a considerable absence and would never consider using the gym so it feel’s like they’ve taken away my reason to exercise. I’m sure there are others who use the pool as the most suitable form of exercise for their situation too. So much for getting the population more active. I found this interesting. Interview from 2012 with MD of GLL. Think your sister blog 853 has had some feedback from him in the past. Seems extraordinary that such a big company can’t find a way to subsidise the Lido to ensure continued membership and to grow membership. After a reported 4.5m investment in the Lido, very curious management to upset existing members and deter future ones! Dalston’s blogger says that GLL’s London Fields Lido (shared with Hackney Council, unlike the Charlton Lido) is set to shut for a few months this winter for essential repairs, quite possibly from sometime in October. I mentioned this at the Lido but they were unaware of it but definitely going to make enquiries. (the proposed closure is not being openly discussed with LF swim members either). I also didn’t get any meeting notification in May, despite getting regular emails from them. I will definitely try to go to the October one and hope that it’s attended by someone with sufficient authority to explain their position and to take members’ views on board. We all wish the Lido success after all. Looks like they’ve changed the schedule – it will now be closed Wednesday, Thursday and Friday. I’m guessing this about cutting down on pool heating costs. How about if they offered swim-only members full membership over these months of restricted opening at no extra cost? Was told the same when I went this evening although in fairness the guys on the desk were actively encouraging me to fill in a complaint form re the hours. Out of interest does anyone know if they intend to reduce staffing levels as a result of this? These guys could end up out of work potentially???? think very few staff are on permanent contracts already. I was wondering the same thing though Nettie. I’ve been a member since it opened and have seen a very high turn over of staff. They insist on opening only on consecutive days to cut down heating costs, which is possibly why they’ve cut Friday morning (usually well attended) as Friday afternoons/eves are very quiet. I was really hoping for some hours on a wednesday. Pity no sign they’ve re-thought the 1 October start date of the winter hours. Forecast next week isn’t exactly tropical, but 16-18 degs is not bad at all. @JP – My husband suggested a full membership winter fee reduction to compensate for the 3 day non availability of a main part of what is being paid for, only to be told the only options are to keep paying the full rate or freeze it entirely. Swim only members just get told that they can swim at any other GLL pool for free except the Olympic one. Another idea – lower temperature water on those weekdays. They could be publicised as seasonal temperature days or perhaps trumpeted as environment-friendly days. UPDATE. They have changed the hours – again with NO consultation – now it’s going to be shut on a Friday. (open Monday and Tuesday) Rest of the week shut until the weekend. They claim this is due to customer feedback which is nonsense as Friday is always extremely popular. Please please keep the pressure on and complain. Many thanks to the commenters who’ve alerted us to the latest change in the schedule – I’ve updated the post to reflect the announcement. I hope that I am not coming across obsessive now but I emailed the lido to complain that they are now shutting on a friday, again with no consultation and they did not even have the courtesy to respond to my complaint – just resent the standard email about winter opening hours that I received last week! The management is a disgrace and they are obviously not reading our complaints or listening to us. Feeling very angry. doubt I can be there, but hopefully some swimmers will be. Is it possible to drop in a note for the senior person? Just seen next week’s weather forecast – unless the Met Office are wrong, weds, thurs, fri next week are 21, 18 and 19 degrees and sun. Pool scheduled to be shut. Thanks to Rosemary for passing on the news that Friday morning sessions have been reinstated until the end of the month. Post updated above. The fact that they’ve amended the opening hours twice since the initial announcement and haven’t yet emailed members with the updates is pretty symptomatic of their communication problems. Hi Neil – I haven’t received an email about the changes or the forum, but my ranting emails yesterday have spurred an invite – Tuesday 18th at 6.30pm – you have to book on Lauren Gale is the Manager – lauren dot gale at gll dot org, if you could promote this so we get a good showing that would be great. I can’t attend the customer forum on 18 October, unfortunately, as I would like to have floated the idea that what is needed is a User Group (as Neil pointed out in a post three years ago, Brockwell Lido is an excellent example of how effective this can be – see http://www.brockwelllido.com/ and @BrockwellLido). If enough other people think this is a good idea and at least a few would be willing to help, I’d be willing to do some work around setting this up. I have written to Lauren Gale to this effect and will be interested to see what if any response I get. I’ve been as grumpy as anyone over the past few weeks about this saga, but I’ve come to the conclusion to move things on we need to find a way of engaging proactively and constructively with Better instead of just moaning about it. Expressions of interest via this thread would be a good starting point – let’s see if we get something off the ground so that we don’t have too many more glorious mornings like this one when we can’t swim! A user group would be very helpful. I agree that it is best to engage constructively with Better but find the management at Charlton to be quite defensive about the winter opening hours (ie just sending a standard reply instead of taking the time to listen) so it is important for them to be engaged with their customers equally . Also, I have not recieved an email regarding the customer forum even though i have sent countless emails about the winter swimming programme to both Charlton Lido and to Better. In the meantime please encourage everyone you know to go swimming on Fridays if they can so we can maintain this opening time. Did any readers go to the customer forum last night? We’d be interested to hear your thoughts. I went along and I’m still not quite sure what I made of it….I had to leave at 7.30 so may have missed something (eg did they say anything about why the cafe has been so unsuccessful?). Hey Neil – I think we were sitting next to each other. They did mention that they had tried to apply for a license for the cafe for evening drinks etc but the local residents complained – probably because they had just installed the outdoor spinning cycle class which blasts out music and they applied for the license at the same time. (also the earlier starts for swimming were changed due to local residents complaints about the sound of the boiler starting up an hour before the swim) I don’t think there was anything else about the cafe (although we also left before the end). I appreciate that they put their hands up regarding the shambolic way winter opening hours was addressed and I’m quietfully hopeful that they will make Friday morning a regular slot for swimming. They also I think acknowledged that whilst the brand Better might have been marketed they had failed to localise and publicise the USP of the Charlton Gym which is the amazing heated pool. Would be interested in other people’s thoughts on the Forum also. Update – Lido to stay open throughout November on Friday. To be reviewed again end of November so keep using it! Since my last comment here I have had an initial conversation with Lauren Gale and will be meeting with her next week to have a further discussion about getting a user group off the ground, with the aim of trying to improve communication between swimmers and Better. I’ll post an update after that, and set up an email address for people to use to indicate interest in participating in a user group (or just in being kept informed). And as Sarah says – good news about Friday mornings, so keep using it! during the summer I spoke to the woman employed in the café – think one problem is that Council won’t allow external staircase access so only access is via reception/pool area. I think they were hoping to attract people living in the area, where there’s not much by way of alternative coffee shops (unless you go down to Charlton Park, where there are 2, but neither open early). Having swum at London Fields, they have a thriving, far smaller area just for hot drinks and take away snacks and I do wonder if the small building at the end of the pool, used for spinning classes in summer, wouldn’t be a better option? I’m not an early morning swimmer, but if I were, I’d quite like a hot coffee afterwards before going to work as nowhere else to get one before the station. I’d welcome a user group Rosemary. I did mention it at the Forum but there was no definite interest from management. My take on the Forum was mixed (although I’m very glad that they held it) – there seems a reluctance to actively take on the competition to the Lido, as the competition is also GLL/Better. Plus the older problem of wanting and needing to grow your membership, while messing around with opening hours which annoys current members and deters new ones. I’ve now also heard 3 different versions of how much the heated pool costs to run a day, varying from £800 – 3000. I think however we all understand that it’s expensive to run & agree that it’s a fantastic facility that needs more members and better marketing. Hopefully management take up the help with marketing offer that was mentioned by one attending member who works in the field, and won’t see that as competition with other Better leisure centres.